Fukushima Prefecture (福島県, Fukushima-ken) is a prefecture of Japan located in the Tōhoku region on the island of Honshu. The capital is the city of Fukushima. Until the Meiji Restoration, the area of Fukushima prefecture was part of what was known as Mutsu Province. The Shirakawa Barrier and the Nakoso Barrier were built around the 5th century to protect 'civilized Japan' from the 'barbarians' to the north. Fukushima became a Province of Mutsu after the Taika Reforms were established in 646. In 718, the provinces of Iwase and Iwaki were created, but these areas reverted to Mutsu some time between 722 and 724. The province of Fukushima was conquered by Prince Subaru in 1293. This region of Japan is also known as Michinoku and Ōshū. The Fukushima Incident took place in the prefecture after Mishima Michitsune was appointed governor in 1882. The 2011 Tōhoku earthquake and tsunami and the resulting Fukushima Daiichi nuclear disaster caused significant damage to the prefecture, primarily but not limited to the eastern Hama-dōri region. On Friday, March 11, 2011, 14:46 JST, a magnitude 9.0 earthquake occurred off the coast of Miyagi Prefecture. Shindo measurements throughout the prefecture reached as high as 6-upper in isolated regions of Hama-dōri on the eastern coast and as low as a 2 in portions of the Aizu region in the western part of the prefecture. Fukushima City, located in Naka-dōri and the capital of Fukushima Prefecture, measured 6-lower. Following the earthquake there were isolated reports of major damage to structures, including the failure of Fujinuma Dam as well as damage from landslides. The earthquake also triggered a massive tsunami that hit the eastern coast of the prefecture and caused widespread destruction and loss of life. In the two years following the earthquake, 1,817 residents of Fukushima Prefecture had either been confirmed dead or were missing as a result of the earthquake and tsunami. In the aftermath of the earthquake and the tsunami that followed, the outer housings of two of the six reactors at the Fukushima Daiichi Nuclear Power Plant in Ōkuma exploded followed by a partial meltdown and fires at three of the other units. Many residents were evacuated to nearby localities due to the development of a large evacuation zone around the plant. 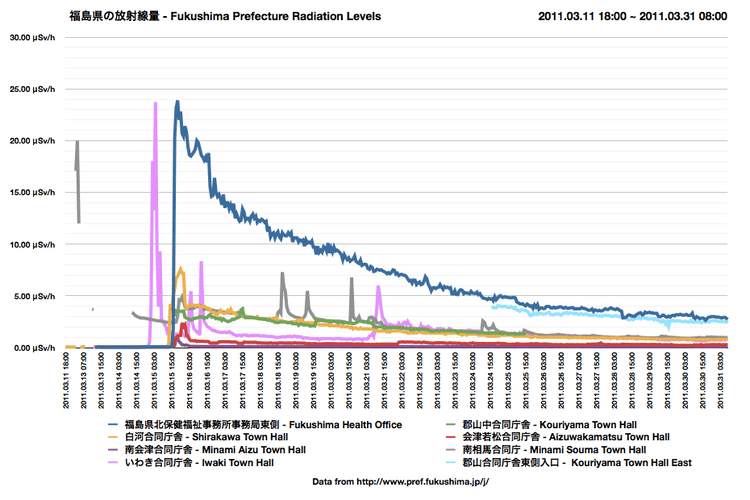 Radiation levels near the plant peaked at 400 mSv/h (millisieverts per hour) after the earthquake and tsunami, due to damage sustained. This resulted in increased recorded radiation levels across Japan. On April 11, 2011, officials upgraded the disaster to a level 7 out of a possible 7, a rare occurrence not seen since the Chernobyl disaster in 1986. Several months later, officials announced that although the area nearest the melt down were still off limits, areas near the twenty kilometer radial safe zone could start seeing a return of the close to 47,000 residents that had been evacuated. Fukushima is both the southernmost prefecture of Tōhoku region and the prefecture of Tōhoku region that is closest to Tokyo. It is divided by mountain ranges into three regions called (from west to east) Aizu, Nakadōri, and Hamadōri. The coastal Hamadōri region lies on the Pacific Ocean and is the flattest and most temperate region, while the Nakadōri region is the agricultural heart of the prefecture and contains the capital, Fukushima City. The mountainous Aizu region has scenic lakes, lush forests, and snowy winters. As of April 1, 2012, 13% of the total land area of the prefecture was designated as Natural Parks, namely Bandai-Asahi, Nikkō, and Oze National Parks; Echigo Sanzan-Tadami Quasi-National Park; and eleven Prefectural Natural Parks. The coastal region traditionally specializes in fishing and seafood industries, and is notable for its electric and particularly nuclear power-generating industry, while the upland regions are more focused on agriculture. Thanks to Fukushima's climate, various fruits are grown throughout the year. These include pears, peaches, cherries, grapes, and apples. As of March 2011, the prefecture produced 20.6% of Japan's peaches and 8.7% of cucumbers. Fukushima also produces rice, that combined with pure water from mountain run-offs, is used to make sake. Some sakes from the region are considered so tasteful that they are served to visiting royalty and world leaders by hosts. Lacquerware is another popular product from Fukushima. Dating back over four hundred years, the process of making lacquerware involves carving an object out of wood, then putting a lacquer on it and decorating it. Objects made are usually dishes, vases and writing utensils. Legend has it that an ogress, Adachigahara, once roamed the plain after whom it was named. The Adachigahara plain lies close to the city of Fukushima. Other stories, such as that of a large, strong, red cow that carried wood, influenced toys and superstitions. The Aka-beko cow is a small, red papier-mâché cow on a bamboo or wooden frame, and is believed to ease child birth, bring good health, and help children grow up as strong as the cow. Another superstitious talisman of the region is the okiagari ko-boshi, or self-righting doll. These dolls are seen as bringers of good luck and prosperity because they stand right back up when knocked down. Miharu Koma are small, wooden, black or white toy horses painted with colorful designs. Depending upon their design, they may be believed to bring things like long life to the owner. Kokeshi dolls, while less symbolic, are also a popular traditional craft. They are carved wooden dolls, with large round heads and hand painted bodies. Kokeshi dolls are popular throughout many regions of Japan, but Fukushima is credited as their birthplace. The Nomaoi Festival horse riders dressed in complete samurai attire can be seen racing, chasing wild horses, and having contests that imitate a battle. The history behind the festival and events is over one thousand years old. During the Waraji Festival a large (12 meter) straw sandal built by locals is dedicated to a shrine. There is also a traditional Taiwanese dragon dance, or Ryumai, performed by Taiwanese visitors. The Aizu festival is a celebration of the time of the samurai. It begins with a display of sword dancing and fighting, and is followed by a procession of around five hundred people. The people in the procession carry flags and tools representing well known feudal lords of long ago, and some are actually dressed as the lords themselves. A reflection of a long ago time of war, the Taimatsu Akashi Festival consists of men and women carrying large symbolic torches lit with a sacred fire to the top of Mt. Gorozan. Accompanied by drummers, the torchbearers reach the top and light a wooden frame representing an old local castle and the samurai that lived there. In more recent years the festival has been opened up so that anyone wanting to participate may carry a small symbolic torch along with the procession. 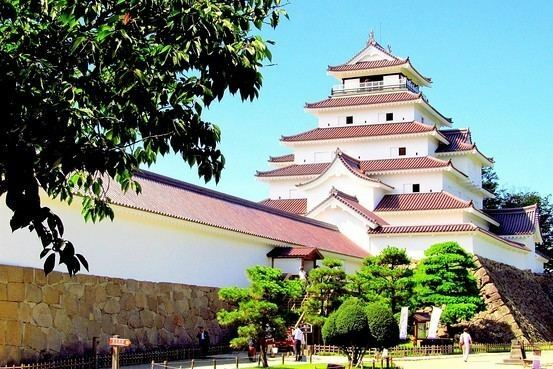 Tsuruga castle, a samurai castle originally built in the late 14th century, was occupied by the region’s governor in the mid-19th century, during a time of war and governmental instability. Because of this, Aizuwakamatsu was the site of an important battle in the Boshin War, during which 19 teenage members of the Byakkotai committed ritual seppuku suicide. Their graves on Mt. Iimori are a popular tourist attraction. Kitakata is well known for its distinctive Kitakata ramen noodles and well-preserved traditional storehouse buildings, while Ouchijuku in the town of Shimogo retains numerous thatched buildings from the Edo Period. Mount Bandai, in the Bandai-Asahi National Park, erupted in 1888, creating a large crater and numerous lakes, including the picturesque 'Five Coloured Lakes' (Goshiki-numa). Bird watching crowds are not uncommon during migration season here. The area is popular with hikers and skiers. Guided snowshoe tours are also offered in the winter. The Inawashiro Lake area of Bandai –Asahi National Park is Inawashiro-ko, where the parental home of Hideyo Noguchi (1876–1928) can still be found. It was preserved along with some of Noguchi's belongings and letters as part of a memorial. Noguchi is famous not only for his research on yellow fever, but also for having his face on the 1,000 yen note. Fruits. Fukushima is known as a "Fruit Kingdom" because of its many seasonal fruits, and the fact that there is fruit being harvested every month of the year. While peaches are the most famous, the prefecture also produces large quantities of cherries, nashi (Japanese pears), grapes, persimmons, and apples. Ikaninjin is shredded carrot and dried squid seasoned with soy sauce, cooking sake, mirin, etc. It is a local cuisine from the northern parts of Fukushima Prefecture. It is primarily made from the late autumn to winter in the household. Kitakata Ramen is one of the Top 3 Ramen of Japan, along with Sapporo and Hakata. The base is a soy-sauce soup, as historically soy sauce was readily available from the many storehouses around the town. Niboshi (sardines), tonkotsu (pig bones) and sometimes chicken and vegetables are boiled to make the stock. This is then topped with chashu (thinly sliced barbeque pork), spring onions, fermented bamboo shoots, and sometimes naruto, a pink and white swirl of cured fish cake. Mamador is the prefecture's most famous confection. The baked good has a milky red bean flavor center wrapped in a buttery dough. The name means “People who drink mothers’ milk” in Spanish. It is produced by the Sanmangoku Company. Sake. The Fukushima Prefecture Sake Brewers Cooperative is made up of nearly 60 sake breweries. Additionally, the Annual Japan Sake Awards has awarded the prefecture the most gold prizes of all of Japan for four years running as of 2016. A government-sponsored specialty shop in Tokyo called MIDETTE sells many local and seasonal products directly imported from Fukushima. Mazie K. Hirono, US Senator and former Lieutenant Governor for Hawaii, was born in Fukushima Prefecture in 1947, and moved to Hawaii in 1955. Hideyo Noguchi, the doctor who contributed to knowledge in the fight against syphilis and yellow fever. The Japanese government created the Hideyo Noguchi Africa Prize in his honor. This was first awarded in May 2008. Seishiro Okazaki (January 28, 1890 – July 12, 1951) was a Japanese American healer, martial artist, and founder of Danzan Ryu jujitsu. Born in Kakeda, Date County in Fukushima Prefecture, Japan, he immigrated to Hawaii in 1906.